Huitlacoche or cuitlacoche has become one of my favorite ingredients lately, ever since I discovered a Mexican grocery store here in Southwest Florida that carries cans and jars of this delicious corn mushroom I have rediscovered it’s earthy and sweet taste and I just can’t get enough of it! 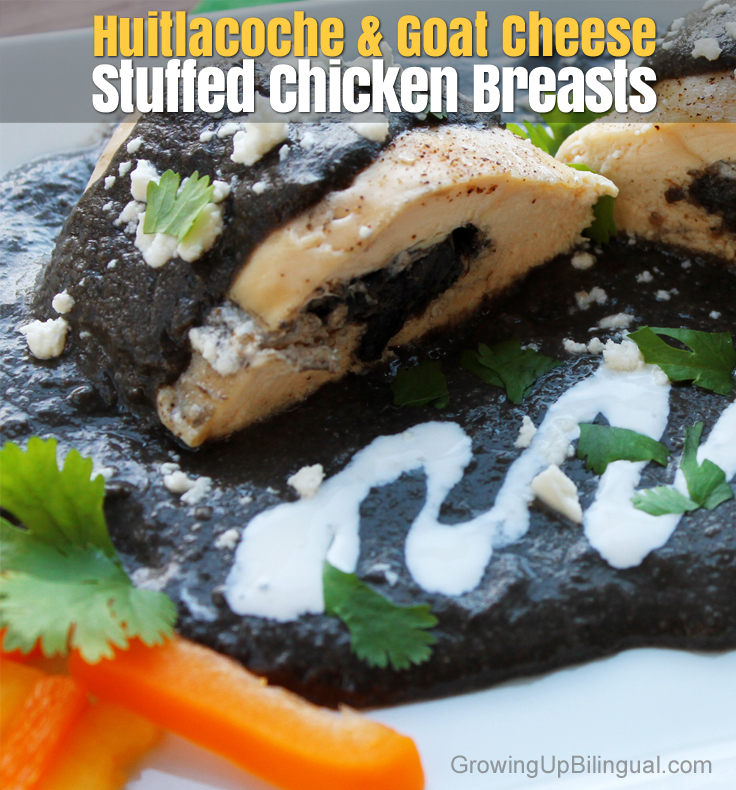 First I tried making some tacos, during the colder months I made a delicious cuitlacoche soup and this time around I decided to make huitlacoche and goat cheese stuffed chicken breasts. In a small bowl mix the goat cheese and 1/2 cup of Huitlacoche. Cut a slit into the chicken breast, making sure you do not cut all the way through and fill with the cheese and Hitlacoche mixture. You can also flatten the chicken breasts, out the cheese mixture in the center and roll. Secure with toothpicks to keep filling inside of chicken breast. Spray a skillet with no stick cooking oil and heat. Place breasts on hot skillet and seal, remove breasts from skillet. Heat oil and butter on medium heat. Add onion and garlic and saute until onion is translucent. Add huitlacoche and salt and pepper to taste. Saute for two or three minutes on medium high heat moving constantly until all liquid evaporates. Remove huitlacoche mixture from heat and pour in blender. Return the huitlacoche mixture to the pan. Add chicken stock and wine and simmer for 5 minutes. Return the chicken breasts to the skillet and cover, simmer for for 10-15 minutes. Remove chicken breasts from skillet and place on serving dish. Mix two tablespoons of chicken stock and corn starch and add to the sauce moving constantly until it reaches desired consistency. Remove from heat, pour over chicken breasts. Top with a tablespoon or two of Mexican cream and epazote for garnish. The combination of the strong and fragrant taste of the goat cheese and earthy and sweet taste of the mushrooms huitlacoche is delicious and creates a great balance. This dish is ideal for entertaining and I love that it’s a great way to introduce family and friends to this exotic Mexican flavor. Have you ever tried Huitlacoche? I’ve never even heard of it! But it sounds delicious. I’ll look for some next time I’m at the Latino grocery. Definitely want to try this one. I´ve never heard of Huitlacoche but it sure looks delicious. Nunca he probado estos hongos, los buscaré porque nos encantan los hongos y esta receta se ve deliciosa, gracias! Paula, me parece increible este plato, la mezcla de cokores es impactante. Muy bueno! Paula muy biena la combinación de este plato y los colores me parecen increíbles. Gracias por la receta. Never heard of it but curious to taste it! Looks real good amiga. Your presentation is magnificent, as always! Que delicioso se ve!. Se me antoja probarla!. Gracias por compartirla. Menos mal que acabo de desayunar, pero los antojos han quedado! Tengo que preparar esta recta prontito. Qué delicia! Muchas gracias por la receta! Yummy! Nunca había escuchado de Huitlacoche lo voy a buscar la próxima vez. Gracias por compartir la receta.